Archaeologists on Wednesday announced the discovery of a pre-Columbian temple in central Mexico City believed to have been built for Ehecatl-Quetzalcoatl, the god of wind. 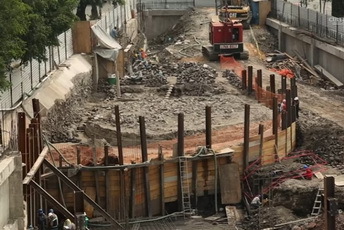 It was excavated at a site discovered two years ago when a mid-20th-century supermarket was demolished. The circular platform, about 36ft in diameter and 4ft tall, now sits in the shadow of a shopping mall under construction. 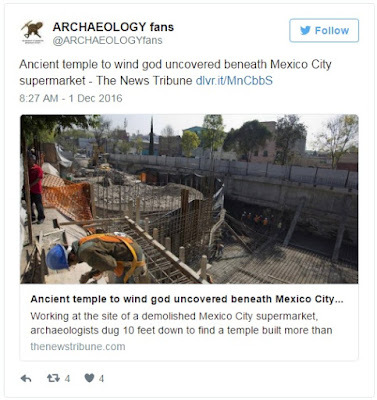 The site is believed to have been built to worship the god of wind, Ehecatl-Quetzalcoatl, and the plans are to preserve it and make it visible to the public with a large viewing window. During the excavation, archaeologists discovered a total of 43,000 objects, including 1,000 complete works. Offerings found at the site comprised ceramic figures of monkeys, bird bones and even an infant with no signs of trauma. The temple is a "glimpse into the past, a place that opens up for us, from the archeological side, to understand the development of the cities that preceded us," Nava said.